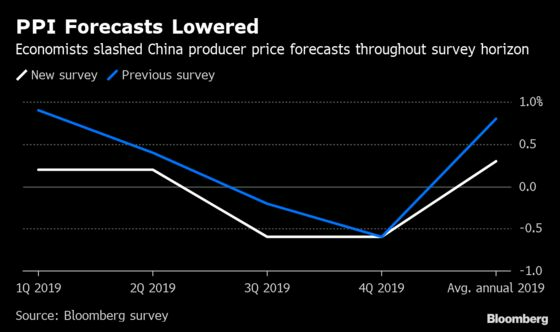 (Bloomberg) -- China’s economy will flirt with deflation this year, with producer prices likely contracting in the second half, according to economists. Factory-gate prices will grow by just 0.3 percent in 2019, according to the median estimate of 15 economists in a Bloomberg survey. That’s down from the forecast of 0.8 percent seen last month. Some said prices could begin contracting as soon as July, with negative price growth remaining until early 2020. The outlook for producer-price gains in the next two years was also cut by almost half to 0.8 percent in 2020 and 1.3 percent in 2021, suggesting a prolonged battle with weak demand and declining industrial profits. The rekindled deflation risks in China add to global concerns on growth. Domestically, tepid price gains bring greater pressure on company debt repayments as their profit shrinks, and weaker fiscal revenues. The People’s Bank of China started cutting interest rates when factory-price growth stayed negative between 2012 and 2016, although it is less likely to repeat that course in 2019 amid a new focus on targeted fiscal stimulus. “Interbank market rates will likely decline further” on slowing producer prices, said Lu Zhengwei, chief economist at Industrial Bank Co. in Shanghai. The divergence between factory inflation and faster consumer price gains will worsen the pressure on manufacturers’ profits, he said.